There’s no doubt that lean manufacturing is a revolution within the manufacturing industry and has long been hailed as a way of future-proofing operations and optimising performance and production. 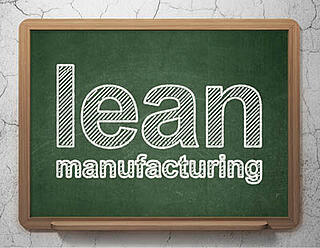 Lean manufacturing is a concept that was originally born at Japanese car manufacturer, Toyota. Officially identified in the 1990s, the procedure was applied to its production system to reduce waste and improve customer value. Lean manufacturing is credited as helping Toyota transform from a small company to a global car giant and as a result, today’s manufacturers around the world are seeing the value in applying lean principles to control their own inventory, reduce waste and improve the overall quality of their products. To many people, the term “lean” is used simply to refer to the set of tools that assist in the elimination of waste. These tools include a number of systems developed and used by Toyota, including value stream mapping, error-proofing, total productive maintenance, control charts – and also Kanban, which is a scheduling inventory-control system for lean manufacturing. Kanban (translated as meaning ‘billboard’) is used to support the supply chain by improving manufacturing efficiency. After Toyota’s success in using Kanban on its own production line, it became regarded as an effective tool for supporting the entire running of a production system and a way to promote improvement internally and externally. The most acclaimed benefit of using Kanban is to set and stick to an upper limit in the amount of inventory that is a ‘work in progress’, thus preventing the overload of the manufacturing production line – also known as ‘queue limitation’. In order to assist with the implementation of inventory-management tools like Kanban, an effective Enterprise Resource Planning (ERP) software system will help. Electronic Kanban can be integrated into a company’s ERP system in order to address and prevent common problems such as errors from manual entry. There are many benefits to using an ERP system to assist Kanban; as an ERP system will prevent the need for repetitive processes and manually entering information. These systems can streamline and automate many business processes and assist in the collection of useful data. With an ERP system, data that was once disparate – often residing in a number of different places – is housed in a single location, making sure it is harnessed effectively as well as kept up-to-date. ERP software also assists with reporting, making it a simpler task and enabling businesses to respond to data requests with ease. Customer service – an imperative part of every business – also stands to improve from the implementation of an effective ERP system; the software makes it simple for staff to interact with customers and to build relationships with them based on the ability to access real-time information and history on each person. Finally, software such as the WinMan ERP system is imperative to improving security, which – in an age where cyber-attacks on businesses are at an all-time high – has become increasingly important. These systems provide adequate protection of customer data and also help ensure consistency and accuracy of data – as well as the successful implementation of Kanban.